By Travis S. Henry, MD, and Marilyn J. Siegel, MD, Mallinckrodt Institute of Radiology, Washington University School of Medicine, St. Louis, MO. A previously healthy 11-year-old male presented to our emergency department with abdominal pain, fever, and a rash. Vital signs at admission included a temperature of 39.1 degrees Celsius, a pulse of 94 to 135 and blood pressure range of 134 to 140 systolic over 77 to 103 diastolic. On physical examination, his lungs were clear, and a soft 2/6 systolic murmur was heard at the lower left sternal border. His extremities were warm, but his pulses were discrepant with 2+ radial and 1+ femoral pulses respectively. Brachiofemoral delay was also noted. A rash was noted on his lower extremities, but not further described. Physical exam was otherwise normal. A chest radiograph was interpreted as normal and an echocardiogram (ECG) showed normal sinus rhythm with left ventricular hypertrophy. Due to clinical suspicion of endocarditis, a transthoracic ECG was performed, and the findings prompted further evaluation with computed tomography (CT) angiography of the thorax. 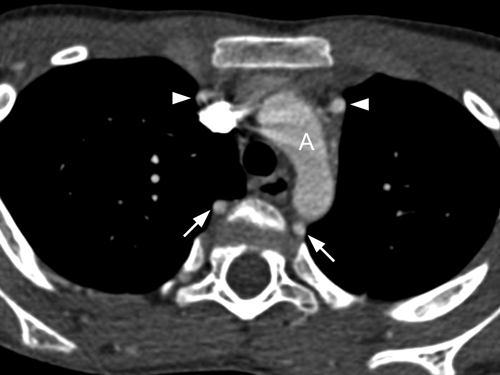 An axial contrast-enhanced CT image at the level of the aortic arch (Figure 1) and at a level 12 mm inferiorly (Figure 2). The ascending aorta and aortic arch (Figure 1) is normal caliber, but the descending aorta is markedly narrowed (asterisk, Figure 2). Enlarged and tortuous intercostal arteries and internal mammary arteries are present. 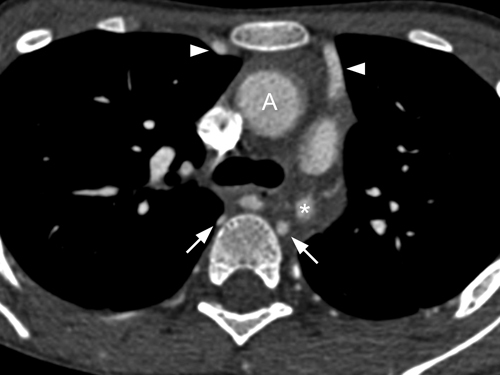 Oblique-sagittal maximum intensity projection (MIP) image (Figure 3) from a contrast-enhanced CT better demonstrates the short-segment coarctation of the proximal descending aorta and the enlarged intercostal arteries. Note the vertical orientation of the left subclavian artery (S) and the mildly dilated aortic root (related to a bicuspid aortic valve). A 3-dimensional volume-rendered image (Figure 4) from a left posterolateral view better illustrates the extensive collateral network that delivers blood flow to the lower body, including the left internal mammary artery, right lateral thoracic artery, and numerous intercostal arteries. Coarctation of the aorta accounts for 5% to 10% of all cases of congenital heart disease.1-3 It is thought to be the result of a malformation of the aortic media, leading to a posterior infolding or shelf.1 Two major types of coarctation are recognized: preductal and postductal. Both forms are easily shown on CT angiography. The less common preductal form of coarctation occurs proximal to the insertion of the ductus arteriosus or ligamentum arteriosum, and is associated with longer-segment tubular hypoplasia of the transverse aortic arch and left subclavian artery. These patients usually present in the first few days to weeks of life with more severe symptoms, including cyanosis (especially of the lower body), congestive heart failure, shock, and necrotizing enterocolitis.1-3 Associated congenital heart lesions include ventricular septal defects, patent ductus arteriosus, and hypoplastic left heart. Imaging is performed to confirm1 the site, morphology and severity of the coarctation,2 the presence and extent of associated collateral circulation,3 associated lesions, and4 the degree of left ventricular hypertrophy. The initial imaging examination is usually chest radiography and/or echocardiography. CT is useful to confirm the site and extent of the coarctation and evaluate collateral vessels. The latter is important for surgical planning as cross-clamping of the aorta may be contraindicated if collateral formation is inadequate because it can result in spinal cord ischemia, necessitating cardiopulmonary bypass for perfusion of the lower body. 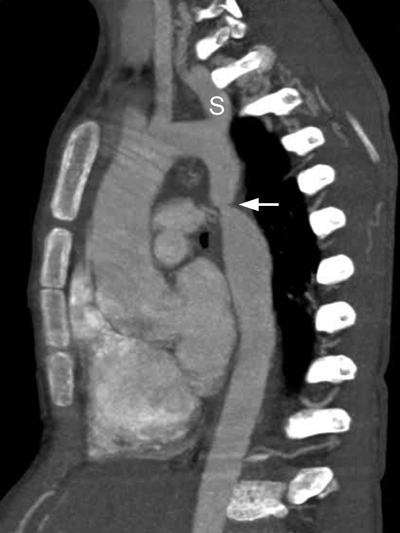 On CT, a postductal coarctation appears as a discrete short-segment aortic narrowing with an infolding or shelf-like appearance of the posterior aortic wall (Figure 1). 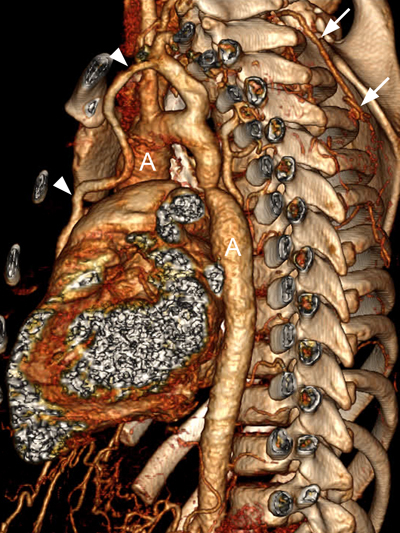 Multiplanar imaging is a necessity, as a very short segment coarctation could be overlooked on transaxial images. Sagittal and parasagittal planes are best to show the location and extent of coarctation (Figures 3 and 4). In the preductal form, the entire isthmus and possibly the transverse arch may be narrowed. The ascending aorta may be dilated and the descending aorta just below the coarctation can show post-stenotic dilatation. We report a case of postductal aortic coarctation. CT provides excellent characterization of the anatomy and may be especially useful in defining the site and extent of obstruction and associated anomalies. 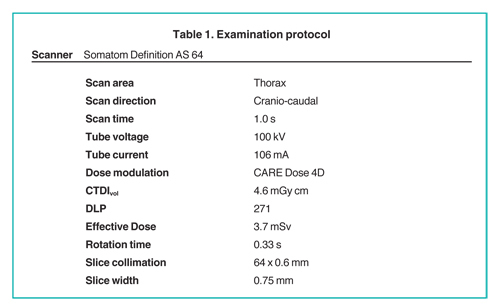 Current CT scanners can provide exceptional levels of anatomic detail with very low radiation dose. Beekman RH. Coarctation of the aorta. In: Alan HD, Gutgesell HP, Clark EB, Driscoll DJ, eds. Heart Disease in infants, children, and adolescents 6th ed. Philadelphia. Lippincott Williams & Wilkins. 2006;988-1010. Joshi VM, Sekhavat S. Acyanotic congenital heart defects. In: Vetter VL. ed. Pediatric cardiology, the requisites. Elsevier Mosby. 2006;79-96. Kaemmerer H. Aortic coarctation and interrupted aortic arch. In: Gatzoulis MA, Webb GD, Daubeney PEF. Adult congenital heart disease. Churchill Livingstone. Edinburgh 2003;253-264. Siegel MJ. Heart. In: Siegel MJ, ed. Pediatric Body CT. Philadelphia. Lippincott. Williams & Wilkins. 2007;145-175. Shih M-CP, Tholpady A, Kramer CM, et al. Surgical and endovascular repair of aortic coarctation: Normal findings and appearance of complications on CT angiography and MR angiography. AJR Am J Roentgenol. 2006;187:W302-W312. 11-year-old male with abdominal pain. Appl Radiol.